It's December, and the holiday season is officially upon us. To celebrate, I’m teaming up with some amazing “elves” to bring you four weeks of fun giveaways between now and the end of the year!! I’m kicking off the holiday fun today with a double dose of goodies! 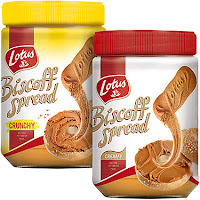 My good friends at Lotus Bakeries sent me a two-jar pack of Biscoff spread to create an original recipe to share with you. They’ve also got some goodies for y'all as well…more details about that in just a sec. But first? I’m going to knock your socks off with a fabulous and fun baked donut! I’ve been eyeing those cute baked donut pans for ages, and I finally gave into temptation and bought one. All because of a brilliant idea that I had to make a baked cake donut topped with a Biscoff-infused glaze! Step 1: Preheat oven to 325 and spray a non-stick donut pan with cooking spray. In a large mixing bowl, add: 1 cup flour, 1/2 cup sugar, 1 tsp. baking powder, 1/2 tsp. salt, 1/2 tsp. cinnamon, 1/4 tsp. freshly ground nutmeg, 1/8 tsp. allspice, and 1/8 tsp. ground ginger. Whisk together and set aside. Add the following ingredients to a small bowl: 1/2 cup milk, 1 large egg, 1 tbs. melted butter, and 1/2 tsp. vanilla. Whisk to combine. Add the wet ingredients to the dry ingredients and whisk just until incorporated. Step 2: Carefully spoon the batter into a large freezer bag. Make sure all the air is removed and snip the corner off of the bag. Squeeze the batter into the wells of the donut pan, about 2/3 full. Bake until the donuts spring back when touched -- about 10-14 minutes. Turn the pan halfway through the baking time to ensure even baking and browning. Step 3: While the donuts bake, make the Biscoff glaze. Add 1/3 cup Biscoff spread and 2 tbs. butter to a non-stick pan over medium-low heat. Whisk as the spread and the butter melt and are incorporated. Whisk in 1/3 cup powdered sugar...it will look like dough, but don't panic! Add enough half-and-half or cream to reach desired consistency for dipping. I used 2-3 tbs. for my glaze. Remove the donuts from the pan and carefully remove from the pan. Let them cool slightly, then dip the tops into the glaze. Step 4: Place the donuts on a sheet of parchment or foil. While the glaze is still warm, sprinkle the tops of each donut with crumbled Biscoff cookies. Let cool until the glaze is set, about 15 minutes. Try to be patient...it's worth it! 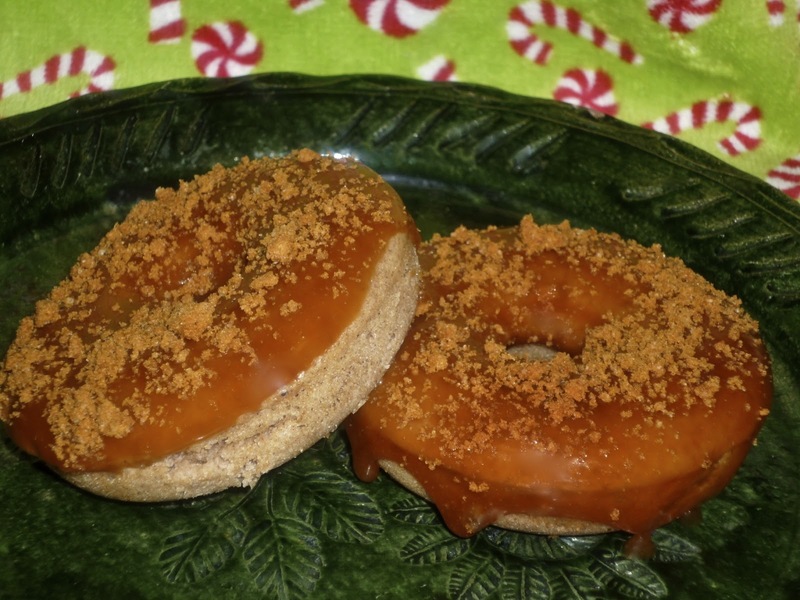 These doughnuts are bursting with holiday flavor…the spices are so comforting! They bake up pillow-soft, and the Biscoff-infused glaze pairs perfectly with the spices in the doughnut. Add crunchy bits of Biscoff cookies on top, and you’ve got one amazing donut. These donuts would be a really fun breakfast for Christmas morning, and I’m sure Santa would LOVE to find a couple of these when he stops by to deliver Christmas presents this year! These babies are definitely Santa-worthy!!! Keep in mind that the recipe above is a half batch, which makes 6 donuts…I knew that’s all that we could be trusted with at Casa Garcia, but feel free to double the ingredients to make a full dozen. Now…about the giveaways! 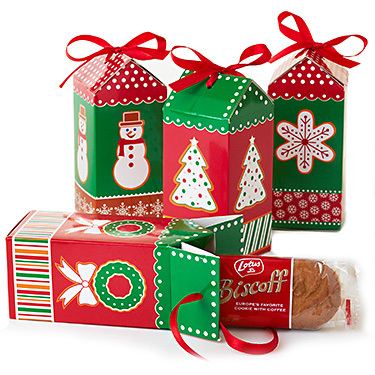 Biscoff is going to give THREE of you a set of four favor boxes like the ones pictured at the top of this post. They're filled with pre-wrapped packs of Biscoff cookies! They’re adorable and perfect for giving a little something to anyone who deserves a special holiday pick-me-up. These favor box sets are also being sold on the Biscoff website, and 10% of the proceeds will go Teach for America to support new teachers who are committed to serving in high-need public schools. For all the details, visit www.Biscoff.com/Teach. One giveaway winner will be chosen by leaving a comment below. A second winner will be chosen via my Facebook page, and a third winner will be selected via my Twitter feed. If you don't already follow me via Facebook and Twitter, now might be a good time to join the fun! For the Twitter and Facebook entries, be on the lookout for me to post a special post sometime in the next couple of days. The first person who responds to these posts when they go live wins…it’s that simple. If that wasn’t enough, I also have a very special GRAND PRIZE gift pack to give away! One lucky reader will receive a two-pack of delicious Biscoff spread – one jar each of creamy and crunchy – plus a copy of the 150 Best Donut Recipes cookbook from Robert Rose Publishing. Entries will be accepted until 1159 p.m. this Saturday, 12/8. Please make sure to leave your e-mail address on your comment so my elves can find you if you’re a winner! I will notify the winner(s) via e-mail on Sunday. Good luck!!! Disclosure: Lotus Bakeries provided me with a two-pack of Biscoff spread to facilitate this post. In addition, Robert Rose Publishing provided me with a review copy of 150 Best Donut Recipes to review as part of this feature. The opinions expressed are my own. I think I'm the only blogger on the planet who hasn't tried Biscoff yet. Maybe it's my lucky week. awesome! thanks!! i love these cookies!! Yum! Love Biscoff anything! And I just got a donut pan, so I can finally make donuts! Donut pan huh? :) Yummo! :) Happy Holidaze! Hi Wendy. I am obsessed with Biscoff. Donuts and biscoff. Oh My! Thanks for the chance at winning a great giveaway. Oh my, these donuts look so yummy. And that glaze-delish! I'm going to be dreaming about these tonight. Never tried it but it sounds good to me.